For all of the Draft Community’s prognosticating (and I admit I was a part of the machine; it’s fun) we all were enlightened with regard to what the respective Front Offices thought of this year’s prospects. None of which irks/intrigues me more (not sure which) from a talent evaluation perspective than this year’s collective group of quarterbacks. If you have so much as perused the Couch Potato General Manager YouTube Channel (a fine subscription I might add) or read or listened to any of the “Features” or Podcasts found at http://www.couchpotatogm.com/ you’d be well aware of our thinly veiled contempt for the latest batch of NFL signal callers. It’s safe to say that we at Couch Potato General Manager (CPGM) haven’t exactly had flattering opinions of the quarterbacks (quarterback play) that comprise the 2017 Draft Class. My not so esteemed colleagues CPGM Drew and CPGM Headley are split on who they believe is the top rated QB among an underwhelming crop and we all have had some pretty harsh things to say about a certain gunslinger out of Lubbock, Texas. But at CPGM we aim to be objective (most of the time) and the many “QB Needy” NFL teams had their chance and now the proverbial clock is ticking on the status of employment of coaches and front office personnel alike as their jobs depend squarely upon the success of a number of these quarterbacks. But before I offer what I like to think is my own, unique brand of analysis there are several fallacies I would like to debunk. The first is this premise that offensive coordinators/coaches at the NFL level MUST build their offenses around the strengths or better yet mask the weaknesses of a diluted quarterback pool due to the invasive nature of Spread Offenses at the collegiate level. You may or may not have noticed but the NFL has already adopted many of the college games’ schematic and philosophical principles. The stark increase in shotgun/spread formations, an uptick in passes being thrown at or behind the line of scrimmage, zone-read/mesh point ball handling, and tempo all have become part of the composition that forms the bedrock of NFL offenses. Frankly, NFL talent evaluators, coaches, franchises HAD to adapt as the NCAA is the professional game’s farm system. So how much more should NFL coaches water down their offenses? I understand why spread offenses are en vogue. Limitations on practice time, contact, and the demands off the field for both “student athlete” and professional are greater than they have ever been. NCAA rules, the NFL’s Collective Bargaining agreement and the demands of instant gratification has made it more difficult to cultivate a young quarterback even if he were steeped in what some would call an archaic prototypical system. It’s not a college staff’s responsibility to ensure that a quarterback is prepared for the rigors of the NFL. Their responsibility is to win games and to a far lesser extent ensure that their players graduate. I have always maintained that most spread offenses are designed to simplify things for all 11 offensive players but the prevalence of misdirection and breakneck tempo has in my estimation further diminished the need for sound execution and technical know-how. The college game is an Arms Race, a numbers game. Collect as many superior athletes as you possibly can, put your best athlete at quarterback and take the mental part of the game post snap out of the equation as much as possible. Problem is the NFL levels the playing field in terms of collective talent from roster-to-roster. Obviously, there are front offices/coaches more adept at drafting talent effectively, navigating free agency and the salary cap compared to others. However, what separates NFL teams on the field more often than not isn’t necessarily the superior athlete but rather how efficiently a team executes (Exhibit A: the New England Patriots). It comes as no surprise that the two most criticized position groups in this class are quarterback and offensive line. It’s a byproduct of the collegiate football climate. In the league execution or lack thereof becomes magnified. As I mentioned before, there typically is less of a talent gap, passing windows get smaller, and quarterbacks find themselves unable to out-run defensive lineman 60-80-100 pounds heavier than them. Another item that requires we take inventory is the “traits” or “upside” discussion. Frankly, I’m tired of hearing either term. That doesn’t mean I don’t recognize their value/importance but I think we’ve jumped the shark to a degree. I admit I was seduced by the “upside” of Robert Griffin III. It wasn’t just his athleticism but I was convinced that he had the smarts/aptitude to understand an NFL offense. Therein lied the problem, it wasn’t about learning the offense. It was about the consistent application of what he would have to learn. The Shanahan’s didn’t do him any favors by acquiescing to Griffin/Dan Snyder’s desire to run the zone read as a staple of the offense. It won’t work in the NFL as a primary form of offense for three reasons: 1) Defenses adapt too quickly; 2) This style of offense looks to take advantage of the defender’s indecision/hesitation; NFL defenses solved this problem by just splattering the QB. 3) It puts your quarterback in harms way far too often. I can understand sprinkling in some of the zone read concepts to help ease a young quarterback into the pro game but at some point the QB has to swim and those athletic gifts will begin to wane over time which makes consistently winning from the pocket within the structure of the offense paramount for prolonged success. After a whirlwind of a rookie season, fast forward a few years and RGIII isn’t even good enough to play for the Cleveland Browns. Now it may sound like I just despise ALL spread quarterbacks and want nothing to do with them. No, that’s not the case because there simply aren’t enough pro-style QBs coming out of college to take that stance. Additionally, I recognize that all spread offenses aren’t created equally nor do all require that the quarterback be a primary ball carrier. That being said, I prefer a traditional drop back signal caller with copious amounts of experience working from under-center more often than not. My take on last year’s Top 2 signal callers in the 2016 NFL Draft Class reflects a departure from my typical stance. You can see my explanation here. You can’t paint stripes on a horse and call it a Zebra. Another point of contention for me is the unfounded assumption that a quarterback that doesn’t demonstrate the ability to consistently win from the pocket within the structure of the offense will do a complete 180 and become a polished pocket passer. How often does it happen that an exciting, improvisational style of play becomes tempered and measured when the bullets start flying on Sundays? I hear the following quite a bit: “He’s got the intelligence to learn a pro-style offense.” He reflects virtually 95% of draft worthy quarterbacks. I don’t doubt that these young men can learn an NFL offense, its terminology, and all of the pre-snap adjustments they are responsible for. What I question is their ability to adjust to the far more sophisticated and challenging post-snap aspects of the professional game compared to the college game; and whether or not he can translate and process the mental and technical aspects of the game in order to manifest the level of physical execution necessary to consistently perform at a high level. We as spectators erroneously equate QB fundamentals and “the basics” with EASY. TB12 is great in part because he’s fundamentally flawless. The last item I want to address before breaking down the individual signal callers is a growing tendency of evaluators (Draft Twitter I’m looking at you) to simply gloss over the importance of mechanical soundness. Rather, the presumption that a young quarterback that has never been held accountable for consistent and sound mechanics will “clean it up” at the NFL level. This school of thought is asinine to me. As if it’s a flick of a switch. It is human nature to revert back to what is most familiar or comfortable. Rest assured your favorite quarterback who just needed to “clean up” his mechanics will regress into the player he once was as opposed to developing into the player he can be (more often than not). Playing the position of quarterback is difficult. Attempting to master the technique driven aspects of the position at the NFL level whilst never being tasked/challenged to do so at the collegiate level is damn near impossible. Why is it that many of the best quarterbacks to play in the NFL aren’t the most physically gifted? The answer is much simpler than the technique driven execution necessary to play at the level of a Brady, Manning or Brees. It starts with “footwork” and mechanical soundness and sound decision-making manifested into fundamental flawlessness. Brady is practically a statue and his arm strength is waning. But he still manages to be incredibly effective as he approaches 40! Yes, he has benefitted from a coach/system that suits his talents (among other things) but you cannot begin to approach the consistent success he’s had if your mechanics are sloppy, regardless of how much arm talent, foot speed, intangibles, and natural playmaking ability you possess. When I’m evaluating a quarterback the very first thing I look at is his feet; it tells most of the story and as spread offenses continue to run rampant and the shotgun becomes more pervasive, mechanics are steadily eroding. Are there exceptions? Yes. Very, very few. Put stock in what will stand the test of time, guns & butter baby, the entire Sunday w/sprinkles. The flash, the WOW, is just the cherry on top. If your defense of your QB of choice in the 2017 class includes poor protection from the offensive line the same could be said for any QB. Very accurate short to intermediate (inside numbers). Solid arm strength outside numbers. Demonstrated a little eye manipulation to work back to primary target. Very effective when first read is open. Decent feel for interior rush. Average in terms of dealing with pressure in general. Inconsistent footwork particularly when working through progressions. Sloppy technique when he reaches the top of his drop. Needs to improve weight transfer to throw to give his receivers a chance when defenders in phase on deep ball. Deep ball accuracy below average. Doesn’t consistently step into throws. Doesn’t push football downfield; chunk yardage coming on busted coverage and run after catch. Has a bit of a side-arm, ¾ delivery could lead to uptick in batted balls in NFL. Struggles with identifying blitz and addressing extra pass rushers. Played in a very QB friendly, one-read system; threw into huge windows rarely tasked with throwing receivers open. Superior supporting cast bailed him out at times. Didn’t raise level of play of his teammates. Does NOT stare down barrel of gun, will duck and throw. Steep learning curve; slow to process information beyond first read. His feet are almost always the culprit when he’s inaccurate. Trubisky is a tough evaluation for me. For one, there is precious little film to actually evaluate and secondly I rarely saw him deliver a stick throw under pressure or tight coverage. 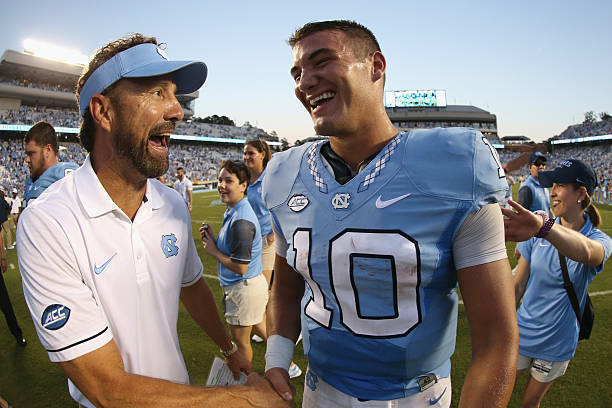 The elephant in the room is Trubisky’s scant starting experience with only 13 (starts) to his credit during his college career. Year-to-year progression is a big factor for me when evaluating a quarterback’s prospects so I would have liked to see him return for his senior year but he enacted the Mark Sanchez power move and rode a strong 2016 campaign to a brief stay in the NFL Draft Green Room. Trubisky would argue that having played in parts of as many as 17 other contests offsets the experience concerns but there’s nothing like being “the man” especially when the opposition has a year’s worth of film on you. Some will argue that Cam Newton had limited starting experience (one year starter at Auburn) and still was selected 1st overall in the 2011 NFL Draft forgoing his senior season but I don’t think it’s an apples-to-apples comparison. Newton garnered starts during junior college as well and while I wasn’t convinced Newton would be as effective as he has been during his professional career (still leaves something to be desired as a pocket passer) but he is a force of nature that actually raised the level of play of his supporting cast. He led the Auburn Tigers to a National Championship during an era where the Southeastern Conference (SEC) reigned supreme in college football. He took the game over on a weekly basis and carried his team to success. He’s gone on to display some of those same heroics in the NFL with the Panthers; at times he is Superman. Meanwhile, Trubisky is more of a Green Arrow (we should hope). Mitchell enjoyed a wonderful 2016 season statistically with a sterling 68% completion percentage and 30 TD passes to a mere six interceptions but also played down to lesser competition. The combination of an RPO-laden spread offense that afforded Mitchell the ability to play pitch and catch in large throwing lanes generated a statistical vacuum that evaluators should have cautiously navigated around. Remember when you thought Nick Foles was good when he posted a 27:2 TD/INT ratio that one year…? I like the fact that Trubisky did a good job protecting the football and most accounts suggest he has an incredible capacity to recall what he has seen or done which should serve him well as he garners more experience but it was evident that when forced off his spot or initial read his effectiveness dropped off substantially. Also concerning are his mechanical flaws in terms of his footwork. Trubisky doesn’t possess great arm talent (it’s adequate) which exacerbates those flaws (Windy City). His head coach at UNC, Larry Fedora, is one of the best offensive minds in college football having previously led Southern Miss to a Top 25 ranking and oh by the way 2 of his top 3 receivers were drafted (I thought all three would be selected) as well as his top 2 running backs. Making a question posed by Mark Callous (member of the CPGM Facebook Group – phenomenal discussion & hijinks) all the more poignant. 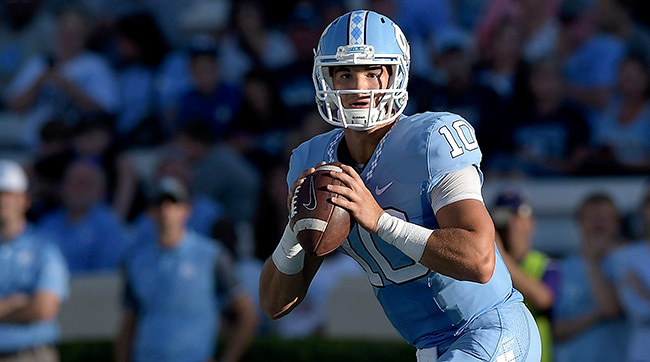 “Are we sure Trubisky was the driving force behind this [UNC] offense and not, at least occasionally, being propped up by the matchup advantages his teammates provided?” I’m certain that those who believe Trubisky was peerless in this class will cite that all quarterbacks need talent around them to be successful. This is factually correct, but I would posit that it was in fact his supporting cast and shrewd play design (thru a college football lens) that routinely made him look more impressive than he actually was. I don’t think he’s particularly adept at pushing the football downfield instead lots of dink & dunk run after the catch marked most of the explosive plays within the offense. I don’t believe the masses truly understand how steep his learning curve will be considering the system and environment he played in, as well as his inexperience on the field and in dealing with (football) adversity; the most severe of which being the fact that he couldn’t usurp Marquise Williams which is neither here nor there in terms of my evaluation of him (upper classmen got the ball, it happens). Of the three first round QBs selected Trubisky landed in the least favorable position and could be thrust into immediate starting duty despite the offseason signing of Mike Glennon. On the one hand he could really use the experience; on the other he is in for a rude awakening as those passing lanes will narrow substantially and the sophistication of the professional game will be a bit overwhelming. He will no longer have the decided skill position advantage in terms of his supporting cast (at least not in 2017) and even though his supporters suggest that the Bears aren’t interested in Trubisky as of 2017 but more so Trubisky of 2019-20, being the 2nd overall pick and the fact that general managers and head coaches typically have short leashes (NFL stands for “Not For Long”) may not afford Trubisky the opportunity to develop into what his fans believe he can become. On top of that, can you unequivocally say that he has the ability to excel as a quarterback at the NFL level after 13 starts in college? The Chicago Bears’ brass certainly thinks so which means Bears’ offensive coordinator Dowell Loggains has his work cut-out for him as Trubisky’s floor, in my opinion isn’t remotely as high as some think despite his apparent tools. Trubisky is a Catch-22. You’d like to sit him down and let him learn from a vet but he needs copious amounts of game experience. Effective throwing on the run, makes it look easy. Attacks voids in middle of defense. Throws strikes between the numbers short to intermediate. Changes speeds and throwing angle effectively. Can get the ball out in a hurry. Does a decent job holding the safety with eye manipulation. Thick base/lower body allows him to escape rush and extend plays. At his best in the scramble drill. Plays with too narrow a base leading to inaccuracy at times (particularly on short/quick throws outside the numbers). Has developed some bad habits both from a technical and decision-making standpoint due to elite arm talent (arm talent hubris). Too quick to abandon the pocket. Doesn’t consistently climb the pocket. Doesn’t set feet consistently, re-sets feet even less frequently when moved off his spot. Gives up too much ground when attempting to buy time. Struggles to identify the free rusher. Holds the ball too low, slight dip in the wind up (but otherwise a quick release). Will get tunnel vision on screens leading to risky throws. Doesn’t throw with enough anticipation. Deep ball accuracy compromised by poor weight transfer (not stepping into throw). Too much hesitancy at top of drop. Needs to do a better job of protecting himself when he becomes a ball-carrier. Played in pass-happy spread system in a conference that went through the motions defensively. Must improve “situational football” decision-making. I must admit that my initial impression when I first watched tape on Mahomes was a bit tainted. His style of play was an immediate red flag for me. The immense amount of hyperbole as @CPGMHeadley would call it surrounding this young man as draft season got underway didn’t help things either. Comparisons to Super Bowl Champions, Hall of Famers and future Hall of Famers ALL things considered was a bit much for my sensibilities. But in order to provide the objective, thought-provoking, and entertaining analysis that is the hallmark of CPGM I had to take a step back and put blinders on while evaluating him. 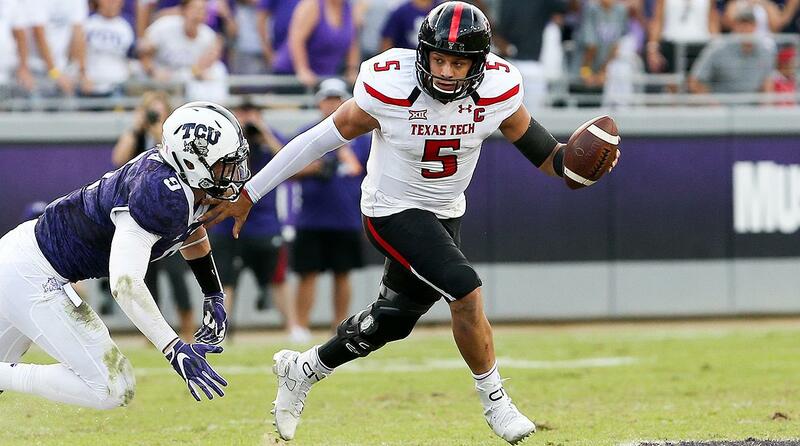 There are three things about Mahomes (and Texas Tech) that cannot be exaggerated: (1) The arm strength/talent is legit, (2) Texas Tech’s defense was atrocious, and (3) His footwork is ghastly. The arm strength/talent is real. There were plenty of “WOW” throws confirming his natural ability to spin the football, no argument there whatsoever. Also, Texas Tech’s defense finished dead last in points allowed in 2016. That’s 128 of 128 in the FBS folks. They weren’t much better in 2015 during Mahomes’ first year as a full-time starter (125 of 128) so while win-loss is a part of the formula I am willing to relax those requirements in his case. That being said, I’m not buying the poor offensive line argument nor do I think he was lacking at all in the way of pass catchers (Jakeem Grant and Keke Coutee can play for my team any day). Time and again his skill position guys gave incredible run after catch effort. It also stands to reason that if you ask your offensive line to pass protect that many times (Mahomes averaged just under 50 pass attempts per game in 2016) and invite defenders to pin their ears back and attack, you’re going to run for your life. In my humble opinion there are several QBs on this list that played behind worse offensive lines and against better defenses on a weekly basis. Additionally, Mahomes’ apparent allergy to the pocket resulted in him making his offensive line look worse than it actually was; routinely abandoning a well-developed pocket or failing to climb said pocket instead opting to scramble and improvise which he is most adept at. Speaking of scrambling, the Mahomies out there praise him for his ability to “stress” the defense and create throwing lanes for his receivers. This is in fact a talent he possesses but in the same breath there are copious amounts of film where he starts the scramble drill pre-maturely. Of course there are times when this folly leads to a completion. No harm no foul right? WRONG. That’s the type of practice that will result in “3 & outs”, turnovers, and get coaches and front office personnel fired at the next level as the margin for error decreases substantially when playing against paid professionals. There are also instances when he gives up a ton of ground only to take a sack which could have been a minor loss of yardage or a throw away but instead is the equivalent of a holding penalty or worse. That isn’t to say that his playmaking ability isn’t a boon, but only if he makes plays within the structure of the offense on a consistent basis. As I’ve stated before to be consistently great you must be epically good. I liken his style of play to being able to read a foreign language but NOT being able to speak it. It’s counter intuitive and it has led to the downfall of many a quarterback, coach and GM. Level of competition has to be considered as well. It’s not an end all, be all, as non-Power 5 and non-FBS schools offer plenty of talent as well but there’s no question that Mahomes faced poor defenses on a weekly basis despite playing in a Power 5 conference. The composite rankings of the nine Big 12 teams he faced off against in 2016 were 90th in passing defense and 84th in total defense (again out of 128; 4 of which ranked 104th or worse against the pass). To counter that point many will point to his Bowl game performance against LSU during his sophomore season. If you take a look at the box score in a vacuum against a talent laden defense it was a good performance. When I watched the film it was less impressive (some WOW plays mixed amongst a lot of negative, head-scratching plays). Then when you juxtapose the Red Raiders’ 27 point output against the 22.4 LSU allowed per game you start to think that maybe Mahomes deserved a little more credit. But after considering that Texas Tech averaged 45.1 points per game (2nd best in FBS) and that an Eastern Michigan team that finished 1-11 (0-8 in the MAC) dropped 22 on LSU in Baton Rouge earlier in the season I settled on unimpressed. We can only speculate as to what Mahomes’ numbers would have looked like had he played against quality defenses week in and week out but those circumstances would have provided a better litmus test as opposed to a solitary, novel matchup provided by the Texas Bowl. Then there’s the footwork. Again his supporters will rattle off names like Favre, McNair, Roethlisberger, Rodgers, and Stafford to rationalize his mechanical short comings and/or style of play. I’m too young to have understood what was going on when Favre played his college ball at Southern Miss but the rest of that group was more advanced from a mechanical/technical standpoint compared to Mahomes in a far less passer friendly era. This was before the “bubble” had become all the rage. Outside of perhaps Favre they all made plays within the structure of the offense consistently in college too (again I wouldn’t know about THE Gunslinger as a Golden Eagle). Every single one of those quarterbacks played from under-center… the significance of that is that playing from under-center typically breeds better footwork. I would prefer my young QB to focus primarily on the nuances of the position at the professional level as opposed to the basics (this can be said of almost all spread quarterbacks). That isn’t to say there isn’t always room for improvement for those of you that are cursing, “Rodgers had to overhaul his mechanics” under your breath. But it was still night and day compared to Mahomes. 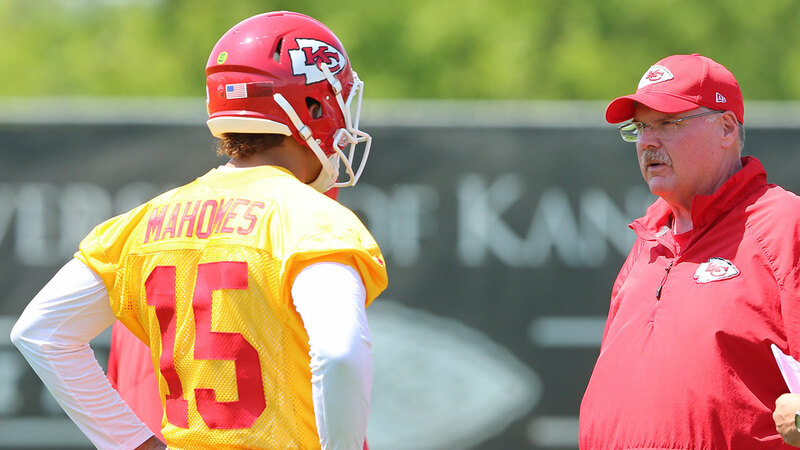 Mahomes landed in a great spot in Kansas City with Andy Reid. The price was steep climbing up 17 spots in the first round of the 2017 NFL Draft to select what I believe is a project of the high risk/high reward variety but QB is the money position. Andy Reid and Miami Dolphins’ head coach Adam Gase were the two play callers that came to mind when thinking of coaches/landing spots that would be most conducive to Mahomes’ success. Pat joins a playoff caliber team with an offensive-minded head coach with a proven track record of having success with far less talented players than Mahomes; as well as quarterbacks lacking in sophistication in the finer points of the position (from a technical standpoint). He won’t be thrust into the starting lineup immediately given that K.C. has incumbent Alex Smith in place affording Mahomes time to get acclimated to the west coast offense and iron out his technical/mechanical shortcomings. Additionally, the Chiefs have a quality defense, balance offensively, and an underrated offensive line in my opinion. So to the Mahomites out there I say, “NO EXCUSES!” It should also be noted that from Year 1 to Year 2 as a starter Mahomes made more plays (still too few) from the pocket despite losing running back DeAndre Washington and left tackle La’Raven Clark to the NFL. I saw more examples of him stepping-up into the pocket and the ball coming out on time but I think in his transition to the next level he will hit the reset button and revert back to his former self (2015 version) as he grasps for what feels most comfortable and natural; at least initially as the speed of the game and defensive sophistication (pre & post snap) enhances in the pros. It’s going to take time to adjust. I also must commend him and his team (advisors/handlers) for having self-awareness particularly throughout the pre-draft screening process. In listening to a number of his interviews he seemed to be acutely aware of the fact that he isn’t nearly as athletic as his supporters make him out to be. He also pointed out that the Big 12 is a track meet offensively and that he forced the issue at times to keep pace. He cited that at the NFL level he could afford to check the ball down and settle for a punt, play field position at times. It still doesn’t explain a litany of ill-advised throws regardless of “down & distance” or score but it’s a start. Now, whether or not he internalizes any of it remains to be seen but it’s encouraging to know that it’s on his radar and I believe he won over a number of front offices with this rhetoric. STILL. What makes Mahomes such an exciting and intriguing prospect are those wholly overrated physical traits (his arm isn’t overrated but arm strength is), upside, and improvisational ability even if forced by no one other than himself. This is problematic. To understate his technical flaws and brush them aside as if he’s learning to tie his shoes is naïve. That doesn’t mean it can’t be done, it means that it isn’t remotely as easy do as it is to say. The fact that he appears more comfortable going off script rather than playing within the confines of the offense suggests mastery of the aforementioned technical aspect of the game will be even more difficult for him. I mentioned that he improved in terms of climbing the pocket but he has a tendency to drop his eyes down to the rush rather than feel the rush; he does the exact opposite when he goes into the scramble drill which explains in part why he’s so good when he’s adlibbing. His lack of anticipation leads to improvisation at times which will make you either cheer in hysteria or break your heart as he throws across his body into the middle of the field. Let’s not forget that while the video game type numbers he posted were staggering he did so against competition that frankly seemed disinterested in defense. Lack of ball skills, poor tackling, undisciplined rushing lanes and awful pursuit angles were pervasive in the Big 12. The Big 12 team that enjoyed the most success in stymieing Mahomes was West Virginia. In two starts against the Mountaineers Mahomes averaged: 25 of 39 (64%), 251 yards, 2 TDs and 1 INT per contest. In his other 23 starts (2016-17) Mahomes averaged: 31 of 47 (66%), 400 yards, 3 TDs and 1 INT per contest. Interestingly enough, 4 of 7 defensive backs from the Big 12 selected during the NFL Draft in 2016 (6) and 2017 (1) played at West Virginia. Rasul Douglas, of West Virginia was the lone selection in 2017. Had Mahomes played on a team with a respectable defense he almost certainly would have had more wins but I’m not convinced he would have won two National Championships (as some have suggested) had he been Clemson’s quarterback rather than Deshaun Watson. Here’s what it ultimately boils down to. He has to effectively change the very fabric of his playing style to be a consistent success in the NFL. Andy Reid will help, particularly with play design but it goes beyond adjusting schematically. It will ultimately be up to Mahomes to acquiesce to and understand when it’s appropriate to bide your time or go for the kill, to throw on time, with anticipation into much smaller windows; never mind the whiteboard or during 7-on-7 but when the bullets actually start flying. The same thing(s) that everyone swoons over regarding his playmaking ability and what makes him such an intriguing prospect could very well be his undoing in the NFL. There you go #Mahomites Kareem Hunt in tow. Offensive line in #KC is set. Great offensive mind at HC. Good defense. Anti TTU. No excuses. Plays with great poise and will stare down the barrel of the gun. Operates consistently within confines of the offense. Does not panic when bodies are around him in/outside pocket. Shows decent touch and adequate arm strength. Actually throws with anticipation and willing to throw receivers open. Offers a nice deep ball. Best QB in class at ball placement WHEN defender is in phase, particularly on vertical routes. Plus mobility and lower body strength. Good ball security; does a decent job protecting himself. Plays his best football in the biggest moments of the biggest games. Mechanics (arm slot/motion) has room for improvement; ¾ delivery affects trajectory and accuracy at times. Can get lazy with mechanics, become an arm thrower and sail passes. Will stare down targets and telegraph his throws. Spread system, one read throws, and half field reads. Must improve post snap coverage recognition. At times appears to be aiming his throws rather than letting his lower body and mechanics drive the football to the target. Ball placement in low leverage situations can be poor. Must improve snap-to-snap consistency as a decision-maker. The Houston Texans followed suit (like the Bears and Chiefs) in the 1st round and traded up 13 spots to select Deshaun Watson with the 12th overall selection in the 2017 NFL Draft. The majority of the free world knew that the Texans would (had to) address the quarterback position following the Brock Osweiler fiasco. The questions were when? And who? Well, we have our answers. Watson enters the NFL sharing many of the same flaws and concerns most spread quarterbacks enter the league with and what makes matter worse is that he’s averaged 15 interceptions a year over the last two seasons; which are particularly concerning when turnover margin is such a huge factor on Sundays. His overall field vision and coverage recognition must improve substantially to be a consistent starter in the NFL although it should be noted that last season it appeared that Watson threw fewer passes that didn’t travel beyond the line of scrimmage (compared to 2015) and he was tasked with making anticipatory throws into small windows (uncommon among spread QBs); which is exactly what will be asked of him as a professional signal caller. When you couple that with his winning pedigree and big game experience it provides as good a foundation you’ll find in a spread quarterback to work with. That being said I’m not convinced Watson won’t continue to stare down his targets and telegraph his throws making it easy for paid professionals to turn him over. But in the same breath I’m confident he will hang in and take a kill shot to the ribs to convert a critical third down. It’s the latter part that intrigues me the most about Watson and why he’s a bit of an enigma. I’m forced to temper my praise of him because of an abundance of RPO, window dressing, and designed quarterback runs in the offense. The system in which he played can skew a signal-caller’s performance favorably, erroneously. Also, his talent laden supporting cast certainly made things easier. There has been no shortage of NFL talent on the Clemson Tigers roster over the past few seasons with more to come. Still, you cannot deny that he took his game to a higher level in the biggest spots as well as buoyed and raised the level of play of his supporting cast in those moments. No situation or circumstance ever seems too daunting for him. When we typically talk about “traits” we refer to the physical attributes, such as arm strength and playmaking ability. Among the attributes that in my opinion sets him apart from his QB cohorts are his mental (and physical) toughness and unflappable demeanor. I think there is something to be said for having the immense success he has had despite facing his fair share of adversity (knee injury, Championship game loss, etc.). Tranquillo, tranquillo, I won’t let the pendulum swing so far in favor of the intangible discussion that we enter the Tim Tebow realm. In fact, I wouldn’t even mention intangibles if the eye test didn’t illustrate that Watson laps Tebow several times over in terms of passing ability. However, I find the risk/reward ratio associated with Watson more palatable than that of Trubisky or Mahomes despite having a lower “throwing velocity.” That’s because not only does he consistently make plays (good and bad) within the confines of the offense but he flashes the ability and willingness to throw receivers open due to his anticipation. “OPEN” by collegiate standards isn’t necessarily “open” by professional standards and the fact that he has already demonstrated that he can make those types of throws is encouraging. It certainly has led to an uptick in turnovers, but anticipatory throws are accompanied by a higher degree of difficulty to execute. 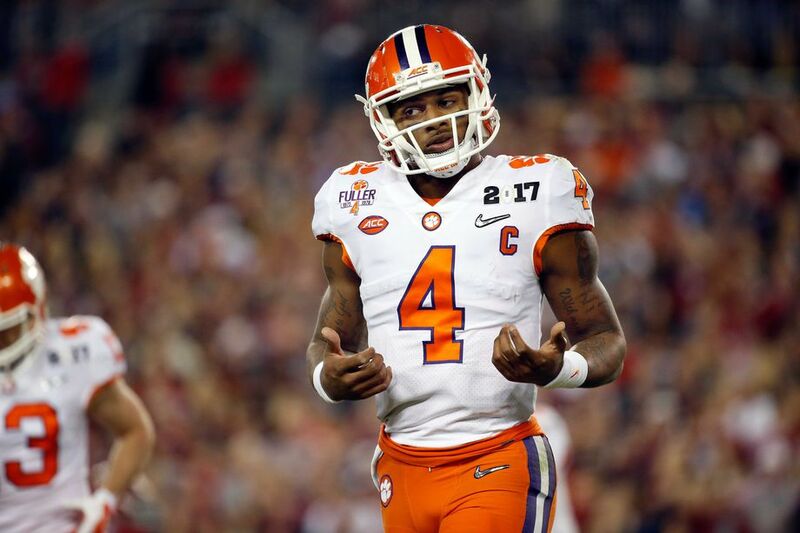 I think Watson and his coaches challenged him to make professional caliber throws that make or break pro quarterbacks. Clearly there are copious amounts of game film where Watson is playing pitch and catch with his receivers, throwing into gaping passing lanes vacated by second-level defenders due to the all too familiar mesh-point play fake but I saw straight drops, empty sets that led to throws downfield as opposed to a bubble or tunnel screen; levels passing concepts, corner routes, back shoulder fade stops, ball on the outside shoulder on vertical routes where only his receiver has a shot at the football despite the defensive back being in phase all of which predicated on (at times) excellent timing and touch with the pass rush baring down on him. When the game hung in the balance I saw less of a spread quarterback taking advantage of a schematic or athletic mismatch but rather timely execution. This isn’t to say that the other quarterbacks in this draft class aren’t capable or haven’t done some of the same things. It’s just that in my evaluation of Watson I have witnessed him doing so more often compared to the field. His 4th quarter numbers are impressive and the corresponding heroics are memorable but among his substantial list of challenges he’s going to have to find more consistency snap-to-snap, drive-to-drive. I cannot measure what type of work ethic the young man has. I don’t know if he’s going to work tirelessly to achieve mechanical/technical greatness rather than rest on his laurels and try to out-athlete his opponent once those checks start rolling in (can’t know for sure with anyone). But you can already see a concerted effort to achieve the former at least in terms of delivering from the pocket and making anticipatory throws. While I waffle about his NFL prospects (success), still he’s an immediate upgrade to Brock Osweiler (who isn’t?). I don’t think Tom Savage, who will be entering his 4th season as a pro will hold off the rookie signal caller for an extended period of time (or any time for that matter). Savage is as untested/unproven (as a pro) as any rookie entering the league with two career starts (5 games played) and 92 career pass attempts to his credit. While Savage has a leg up on Watson in terms of the playbook and terminology this smacks of an open competition that GM Rick Smith and Head coach Bill O’Brien desperately want Watson to win so that the Texans can quickly turn the page on the seemingly perpetual faux pas that is the Houston Texans’ quarterback position. On the surface, landing with the Texans with an “offensive minded” head coach and a talented/playoff caliber roster (on both sides of the ball) is as favorable a situation any rookie quarterback could hope for. Unfortunately for Watson, not only does he have a substantial learning curve to overcome as he transitions from the familiar and QB friendly confines of the spread system that he ran in college but I remain steadfast in my belief that Bill O’Brien isn’t adept at grooming quarterbacks despite what his “quarterback whisperer” moniker might suggest. Aside from a brief stint as offensive coordinator/QB Coach of the New England Patriots where he had a seasoned and accomplished Tom Brady at his disposal; O’Brien’s “best” coaching job in terms of quarterback development was at Penn State during Christian Hackenberg’s freshman season (big whoop). Probably his next most notable coaching stop was at Duke University, as offensive coordinator when he “coached up” the greatness that is Thaddeus Lewis. Good luck Mr. Watson! 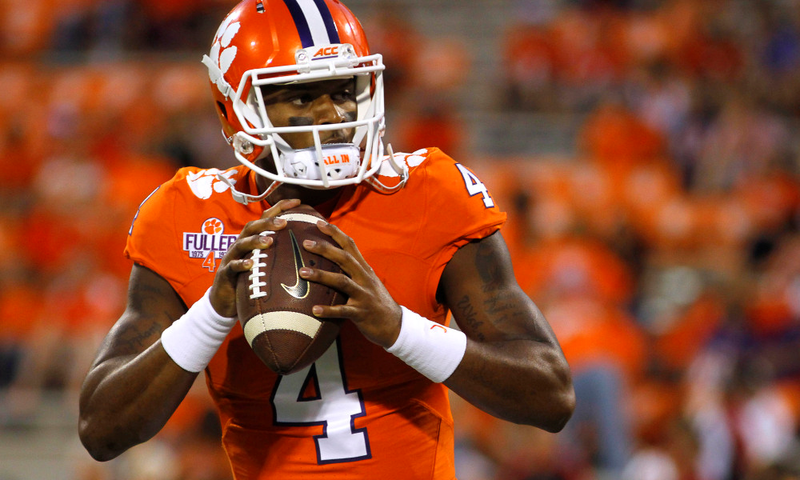 I don’t think Watson is a slam dunk of a quarterback prospect; but I do believe his is ahead of the curve in terms of what it takes from a passing perspective to be successful in the NFL considering the entirety of the 2017 Rookie Quarterback Class. His penchant for winning doesn’t hurt either. Very strong arm; plenty zip on throws outside the numbers. Demonstrated improved patience with experience and increasing willingness to work through progressions. Decent mechanics but poor weight transfer, leads to flat-footed delivery and sailed throws. Willing to stand tall and deliver from the pocket. Decent pocket awareness and good movement. Despite limited experience demonstrated command of offense. Initial eye-ball test really looks the part. Did not complete a high enough percentage of his throws. Long delivery mitigated somewhat by arm strength. At times attempts to look off defenders but loses sight of defenders when working back to intended target. No feel for blindside rush. Lot’s of shotgun can get lazy mechanically ultimately resulting in inaccurate throws. Too quick to tuck and run at times. Not sure what’s going on between his ears. Question marks regarding how well he deals with adversity. Short accuracy/ball placement shaky due to lazy mechanics; has a tendency to concentrate more when pushing the football downfield (intermediate/deep). Snap-to-snap consistency questionable at best. Head scratching decisions at time, mental lapses. Gets self into trouble with indecisiveness. Too slow to pull the trigger at times, needs to speed up internal clock. I commend the Browns for not going QB in the first. With so many other needs and a relatively underwhelming QB class compared to a stacked defensive talent pool I think the Cleveland Browns did well to grab Deshone Kizer on Day 2. He like all of the quarterbacks selected in Round 1 are projects and I don’t believe an organization should REACH for a project. That being said I actually think incumbent Cody Kessler acquitted his-self rather well during his rookie season all things considered. But competition is a good thing, particularly when you don’t have a clear cut starter at this juncture. Kizer absolutely looks the part when he is dialed in and focused. Problem is he has what appears to be a lapse in concentration at times. Some scouts believe it to be a lack of attention to detail; others think Kizer is more concerned with the “celebrity” the NFL can afford him as opposed to putting in the work necessary to enjoy sustained success. A number of his quotes and pre-draft interviews were heavily criticized and reportedly turned a number of teams off. 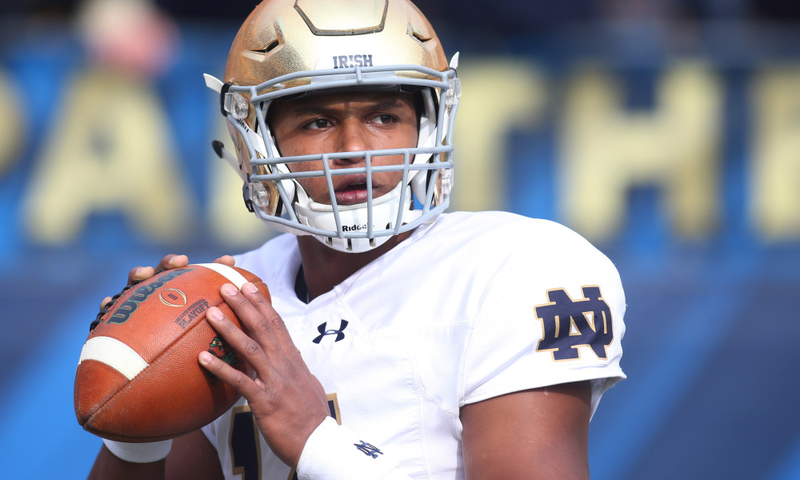 However, considering the musical chairs approach applied by Notre Dame Head coach Brian Kelly and some of the self-scouting excerpts from Kizer it could very well be a matter of confidence in what he’s being asked to do; assuredness. I’m not a stickler for the new wave analytics such as ball velocity but I do place some stock into prehistoric statistics such as completion percentage and TD/INT ratio adjusting for supporting cast and offensive system of course as year-to-year progression is one of the main elements I consider in evaluating a quarterback prospect. While his completion percentage regressed and dipped below that 60% threshold (no bueno) he did improve his TD/INT ratio from approximately 2:1 to 3:1; which of course is a microcosm of Kizer’s career at Notre Dame. There are times you get really excited about the young man’s prospects and others where he’s really hard to watch. I would have liked him to return to school to garner more experience (only played in 25 games started even fewer) but I can understand wanting to move on from looking over your shoulder and answering to the aforementioned Kelly. When we talk about physical tools I think he is the standard in the class. His arm rivals that of Mahomes and he has good athleticism at his size. However, physically tools are often overblown and unfortunately, his snap-to-snap consistency is non-existent. He misses entirely too many “easy” throws and could end up being the quintessential tease at the position. It’s hard enough to be a consistent success playing quarterback in the NFL and I don’t know that he can overcome whatever ails him between the ears. It’s challenging enough that he has a litany of items to improve upon on the field but there are questions about his leadership and intangibles (lack thereof) as well which compounds matters. Maybe if he takes to “good” coaching, and becomes a perfectionist he could become a quality starter. That being said, the chances he flops and completely face plants are exponentially greater for reasons within and beyond his control. Good base, solid footwork up until reaching the top of his drop, follows with poor weight transfer resulting in arm throws. Demonstrates good touch/timing on deep throws particularly on the right side of the field (go-routes). Willing to climb the pocket and help his tackles. Struggles with intermediate/deep ball accuracy on the left side of the field. Tendency to fail to engage lower body and drive the football resulting in overthrows. Short throws become long throws because he holds the ball too low at the numbers resulting in a longer delivery. Lacks superior arm strength, coupled with elongated delivery allows defensive backs to drive on timing patterns outside the numbers. No anticipatory throws; doesn’t throw receivers open. Does NOT demonstrate willingness to stare down the barrel of the gun. Stark contrast between his accuracy inside and outside the numbers. Accuracy wanes as he attempts to work through progressions. Interceptions are particularly egregious (several on screens highlighting his poor field vision), poor decision-making and/or ball placement. Pre-snap recognition below average, can’t deal with free rusher. Uses a shoulder dip/fake to influence defenders, rather than a pump, very telegraphed. Rarely uses eyes to manipulate coverage (lot’s of pre-determined reads); typically will look off safety only when working from one side of the field to the other on a “go-route” see Chad Hansen. No experience turning back to defense, working under center. Despite the fact that Webb got a little first round buzz leading up to the 2017 NFL Draft nothing he demonstrated on tape suggested he should be a Day 1 pick; and even though the New York Giants decided to select him in the third I don’t believe he was a particularly astute selection on Day 2 either. New York’s most glaring need was along the offensive line and they did little to nothing this offseason to improve the position group. So while I wasn’t completely opposed to the idea of adding a developmental prospect at the quarterback position to potentially succeed Eli Manning, Webb seemed like a reach. I believe a decent showing during the 2017 Senior Bowl where he led all three of the South team’s scoring drives (16 points total) going 11 of 16 for 165 yards and a TD overall juxtaposed against underwhelming performances from his fellow signal-callers vaulted him up draft boards. 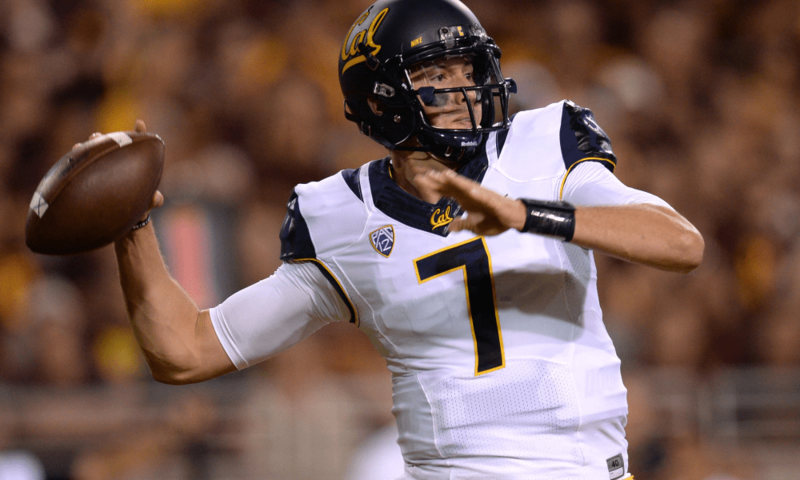 Perhaps his efforts during the Senior Bowl Week practices furthered his cause in terms of professional scouts regarding his NFL prospects because his lone year as starter at Cal this past season was not particularly impressive. Webb has prototypical size and demonstrates nice touch on vertical patterns but that’s about it. He doesn’t play to his size (does NOT stand tall in pocket) and he lacks functional mobility. His decision-making is poor as he threw a number of horrific INTs and would be interceptions despite a healthy number of his throws coming at or behind the line of scrimmage, typically high percentage/easy throws. There is very little if any anticipation to his games as he has to “see it” to deliver it and his accuracy drops precipitously at all levels of the field if he has to work thru progressions. 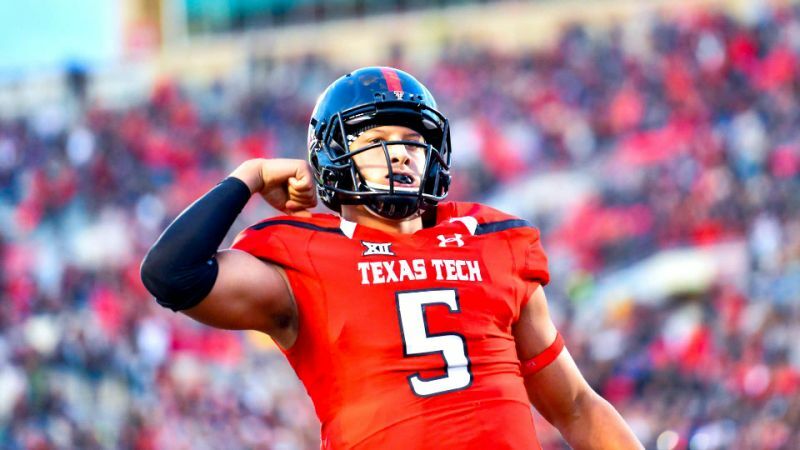 His transfer from Texas Tech is well-documented as well and you may have already surmised that I’m not a big believer in Webb’s former Red Raider teammate Patrick Mahomes; but Webb only possess a modicum of Mahomes’ talent and virtually all of his flaws. He does have the benefit of entering the NFL with no pressure to perform immediately and as a third round pick he will be under contract for, four inexpensive years. Head coach Ben McAdoo appears to believe Webb has the tools necessary to develop into a starter in his system (I do not) but it won’t matter who is under center if the Giants don’t get their offensive line fixed. Played in traditional pro-style offense (no hybrid). Does a good job of taking what the defense gives (supporting cast affords). Occasionally raised the level of play of supporting cast. Has requisite arm strength to make most if not all throws. Shows decent knack for delivering the ball short to intermediate on the run (boot/waggle). Will stare down the barrel of the gun. Does not climb the pocket on a consistent basis. Will abandon a solid pocket. Doesn’t consistently demonstrate touch needed to complete deep throws or “gimme” throws. Needs to speed up the process in terms of getting to the top of his drop. Struggles to handle free rusher. Ball placement can be hit or miss. Too slow to pull the trigger; double clutches giving defenders too many opportunities to close on him and/or the pass. Lacks consistency in working thru progressions. Doesn’t do much in terms of manipulating coverage via eye discipline. I admit I had watched very little of Beathard prior to the draft and even after evaluating his game film thoroughly I thought Beathard was more of a Day 3 prospect as opposed to a Day 2 guy. However, from game-to-game it became obvious why new San Francisco 49ers Head coach Kyle Shanahan coveted Beathard. Among the quarterbacks selected in this draft class no one played in a more prototypical (or challenging) style of offense compared to Beathard. In addition to the bootlegs and waggles traditionally found in the west coast offense (Shanahan’s offense) Beathard had straight 3, 5, and 7 step drops from under center. He also demonstrated moderate athleticism in the scramble drill although it did not translate to functional mobility in the pocket. Still there are elements of his game that invoke thoughts of Brian Hoyer and Kirk Cousins which Shanahan and GM John Lynch pounced at; both from a physical and intangible standpoint. That being said he disappointed in terms of poor pocket presence and demonstrated an inconsistent stroke to all levels of the field. It doesn’t help matters much from my perspective that he draws comparisons to the aforementioned Hoyer and Cousins considering I’m not much of a fan of either signal caller. Beathard didn’t deliver the football with the anticipation necessary to fit the ball into small throwing lanes on a consistent basis as was necessary in the offense he played in (and in the NFL). Injuries and a lack of overall playmaking ability among his supporting cast exacerbated this issue but his level of execution overall was average at best. 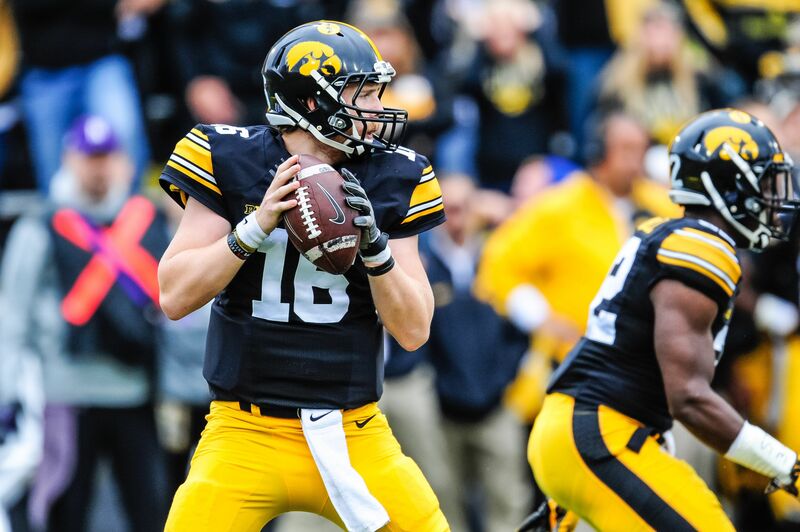 To his (HC Kirk Ferentz) credit he won 75% of his starts and at times Beathard carried Iowa with timely throws but too often it seemed Iowa won in spite of him. Iowa’s ball control, run first offense had something to do with that but as I alluded to before there were too many examples of futility in the execution of the forward pass. Given his propensity for protecting the football in a challenging offense he appears to have “game manager” capabilities which can be useful at the next level. Not a complete indictment of his skill-set but not exactly an endorsement either. Interestingly enough Beathard’s style of play certainly fits into what I expect will be the 49ers offense under the Shanahan/Lynch regime. If he truly is a Cousins/Hoyer type player the Niners will have to get to work on re-constructing the roster particularly on the offensive side of the ball. He strikes me as more of a complimentary QB (eventual low end starter/career backup) as opposed to guy capable of taking games over with his arm. Throws well on the run. Decent footwork but doesn’t engage lower body when delivering the football resulting in arm throws, lost velocity. Willing to stare down barrel of the gun and deliver the football. Excels on boots & waggles. Does a good job of getting his shoulders squared when on the move prior to delivering the football but accuracy still lacking. Makes a concerted effort to keep his eyes down field but his field vision is below average. Has a redeeming tendency to raise his level of play when the game hangs in the balance. Snap-to-snap consistency isn’t there; like a pitcher that struggles to repeat his delivery and find the plate. Struggles with intermediate and deep ball accuracy. Ball placement problematic; tends to throw behind his target. Doesn’t demonstrate ability to work through progressions; one read and tuck typically. Precipitous drop in accuracy from one read to the next. Pocket awareness suspect; doesn’t feel interior or edge rush all that well. Has a tendency to leave the pocket prematurely and rely too heavily on his legs. Considering that his formal education is in Aerospace Engineering I have no doubt that Dobbs will be able to grasp Pittsburgh Steelers offensive coordinator Todd Haley’s playbook in short order. However, the universal question I have for any quarterback (especially those coming from a spread system such as Tennessee’s) is, “Can you apply what you’ve learned post snap?” That will be, for this young man, a monumental challenge as there are precious few examples of his playing style translating into sustained NFL success. 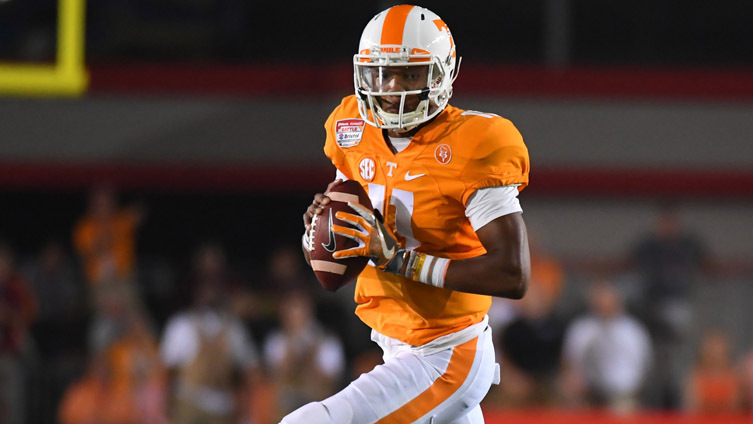 Dobbs appeared to have good command of the offense during the Senior Bowl as he was coached up by Browns’ Head coach Hue Jackson, taking some snaps from center and completing 12 of 15 attempts. But, most of his throws were of the half roll, half field read variety. Still the use of the tight end and the passing concepts demonstrated during Senior Bowl week were more sophisticated than what he was asked to do at Tennessee. His academic prowess suggests that the “X” and “O” aspect of the game should be child’s play and he certainly possesses the intangibles for the position not to mention the best wheels at the position in the class; but whether or not he has the requisite football acumen (accuracy and decision-making) is an entirely different question. His shaky accuracy is a huge red flag as there generally aren’t any substantial leaps in effectiveness in terms of accuracy from one level to the next. Rather, you see some improvement in completion percentage due to experience and familiarity with the concepts and speed of the professional game. It typically isn’t a byproduct of a physical adjustment in my estimation (we have a tendency to revert to what’s most comfortable or familiar). Regardless, if Dobbs is to effectively succeed Ben Roethlisberger at some point he’s got a steep, mountain slope of a climb and it starts by having to improve his ball placement dramatically and do a much better job of protecting himself and the football. I think at best he can develop into a complimentary guy if surrounded by elite offensive talent (which the Steelers possess). Experience in pro-style system; can play with back to defense. Mechanically sound in drop and delivery. Holds football just below chin strap creating a quick/compact delivery. Solid accuracy on the move, half roll. Very comfortable with levels passing concepts. Works between the hashes well. Decent athleticism and functional mobility. Willing to stare down the barrel of gun. Re-sets mechanically when forced of his spot an advanced technical trait. Field of vision only average. Puzzling lack of anticipatory throws considering he comes from pro-style offense. Too few small window throws, examples of throwing the receiver open. Ball security problematic; tends to fumble when contacted while scrambling. A bit too quick to tuck and run. Speeds up process unnecessarily (internal clock ahead of schedule); results in a frenetic/careless style of play at times. Stares down his fair share of receivers. Will drop eyes down in an effort to avoid the rush rather than feeling, sliding and climbing pocket to evade pressure. Peterman was yet another quarterback the CPGM Front Office had an opportunity to watch live at the 2017 Senior Bowl. He took the lion’s share of the snaps for the North squad posting a 16 of 23, 153 yards, and 1 TD line. Unfortunately, Peterman wasn’t as sharp as his numbers might suggest as he missed former ECU now fellow Buffalo Bills teammate wide receiver Zay Jones on several occasions including a couple of scoring opportunities. Considering that the offense Peterman played in at Pitt will actually share similarities to the pro system he will be learning it stands to reason that Peterman has a relatively high “floor”. Conventional wisdom might suggest as much and it may in fact be true but not unlike the 2016 media darling Carson Wentz his time under-center usually involved waggles and half-field reads as opposed to the full field reads necessary to separate yourself from the pack at the next level. Additionally, Peterman isn’t blessed with superior arm talent which is compounded by a lack of anticipatory throws particularly outside the numbers. However, Peterman is ahead of the curve in terms of mechanics and performed fairly well despite playing in a less than friendly QB system while at Pitt. His short to intermediate accuracy inside the numbers and “pro-style” pedigree will keep him employed for a long time I suspect even if it is as a backup. The battery of former GM Doug Whaley and new Head Coach Sean McDermott didn’t last long but incumbent Tyrod Taylor and his re-structured contract all but assures him the starting gig at least in 2017. Cardale Jones is on the roster as well so we likely won’t see Peterman this upcoming season and he may be inactive on most game days; although offensive coordinator Rick Dennison’s West Coast offense may play more to the strengths of Peterman compared to Jones; Dennison being a Mike Shanahan/Gary Kubiak disciple. Tough; stands tall in pocket. Good mechanics when clean – footwork, engages lower body. Good secondary drop byproduct of proper mechanics. Good when in rhythm within structure of offense. Helps tackles by climbing the pocket. Demonstrates consistent accuracy between the hashes and down the seams. Adequate arm strength outside the numbers (not a frozen rope). Improved deep ball during junior season (coaching change more pro-style; less spread, mesh ball-handling and RPOs). Has a tendency to stare down receivers. Loop to throws outside numbers allowing defenders to drive on football. Inexplicable lack of awareness in terms of delayed blitzes or late movement/shifts from defense as play clock winds down. Needs to speed up the process in terms of mechanics and decision-making. Carries football too low at the numbers slowing delivery. Will telegraph passes leading to inordinate amount of batted balls at the line of scrimmage. Too many stretches where offense stagnated; streaky. Simply didn’t make enough plays on third down. Deep ball average at best, underthrows. Not athletic; demonstrates below average functional mobility. Influx of pistol/spread during sophomore campaign detrimental in his development. Kaaya would have done well to return as Miami’s signal caller for his senior season despite being a three-year starter. The peaks and valleys in his play were too frequent and severe and his limited athletic profile resulted in him lasting until the 6th round before the Detroit Lions decided to select him to compete for backup duties behind Matthew Stafford. I thought there were several quarterbacks on this list that Kaaya should have been selected ahead of but the fact remains another year under Mark Richt’s tutelage could have made a substantial difference in terms of guaranteed dollars for the young man. There were stretches where Kaaya looked like a prototypical Day 1 Prospect and there were even more games where Kaaya looked like an undrafted free agent. While I think in terms of footwork and mechanicas both Kaaya and Peterman are the most advanced in the class they are polar opposites in the pace at which they play the game. Peterman has a tendency to be frenetic and speed up the process unnecessarily. Meanwhile, Kaaya despite decent movement skills in the pocket and ball placement (when clean) really needs to speed up the process. If he was too slow to recognize blitzes and get the ball out of his hands at the collegiate level the speed of the pro game will be entirely overwhelming for him. To this day I still scratch my head regarding his lack of pre-snap recognition despite being a traditional drop back passer. Third and medium-to-long was an effort in futility. When the opposition knew it was an obvious passing situation Kaaya and his offensive line really struggled; far too many 3 & outs. That being said, I recognize his mental and physical toughness. He came in as a true freshman, enrolling during the summer of 2014 only to be thrust in as the starting quarterback in the ACC after a few short months following Senior Prom and taking a beating for three straight seasons. Also, three head coaches and virtually three different offensive systems/philosophies didn’t exactly help matters. Brad’s rookie season in the NFL figures to be a great learning opportunity as he will sit behind one of the best quarterbacks in the NFL and be coached by one of the best young offensive coordinator’s in the NFL in Jim Bob Cooter in addition to having a head coach with an offensive background in Jim Caldwell. However, his prospects as a starting NFL quarterback (long term) are remote as it currently stands. Can make all the throws to any part of the field. Short, quick release gets the ball out in a hurry. Willing to climb the pocket. Demonstrates willingness and ability to make professional throws into tight windows/coverage. Relentlessly attacks area of the field behind linebackers and in front of safeties in the aforementioned tight windows. Exhibits toughness, ability to extend plays and deliver with accuracy. Needs to improve consistency from half-to-half; streaky. Too aggressive at times needs to do a better job of identifying when to check it down. Plays with a bit too much recklessness; doesn’t protect his-self. Doesn’t demonstrate consistent touch on throws, reaches for the fastball too often. Could stand to be a bit more patient when climbing the pocket (be a passer rather than a runner). Plays with too narrow of a base at times and has a tendency be lazy with his footwork on quick hitting pass plays leading to inaccuracy. Mr. Irrelevant! 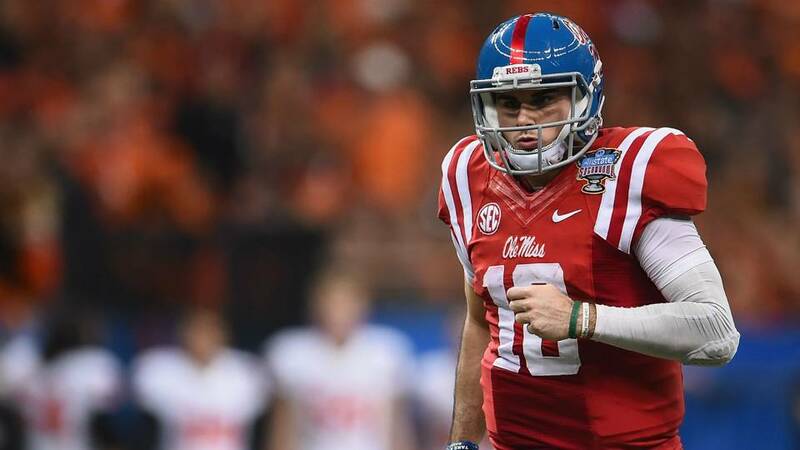 If only… Throughout the course of his college career Chad Kelly has garnered as many headlines for what he did OFF the field as on. In the seventh round, last pick of the draft the RISK aspect of this pick is somewhat mitigated. That being said, you’d like a prospect at the quarterback position to be clean from an injury and character perspective (which he most certainly is not). My lasting impressions of Kelly at the end of a tumultuous and injury shortened 2016 (his Senior) season was “gunslinger; turnover prone; classic spread guy.” That didn’t really change after re-watching his 2015 film but I was reminded of how much arm talent and athleticism he has. Of course his footwork is sloppy, he tries to do too much, and for whatever reason he lacks in-game consistency half-to-half. Living in that spread system, he allows himself to get lazy when throwing short/quick jeopardizing ball placement and telegraphing some of his throws. Still the talent is tantalizing as he fit the ball into small windows intermediate and deep, inside and outside the numbers; even doing so within the confines of the offense no less. He made a litany of professional caliber throws from the pocket and on the move on time. If he did a better job of NOT locking onto a receiver pre-snap and allowed the coverage to dictate where he went with the football he would have done a better job of protecting both the football and himself. It remains to be seen what the Broncos offense will look like exactly but reports out of Denver suggest there will be more spread elements in the offense as opposed to the traditional west coast style former Head coach Gary Kubiak ran. I wasn’t a fan of Paxton Lynch out of Memphis nor incumbent Trevor Siemian and with a new coaching staff in place it stands to reason Kelly (if healthy) will get a chance to compete. That being said I seriously question his make-up/temperament and he faces the same steep learning curve that all spread quarterbacks face transitioning from the college game to the pros. Not at all confident that he will dedicate himself to the craft, take to coaching and reign in the immaturity let alone execute at the level necessary to be consistent as opposed to sporadically offering the WOW.